Working full-time and being a parent can be very difficult. Even if you have a great career and happy family life, there will be times when free time is at a premium. 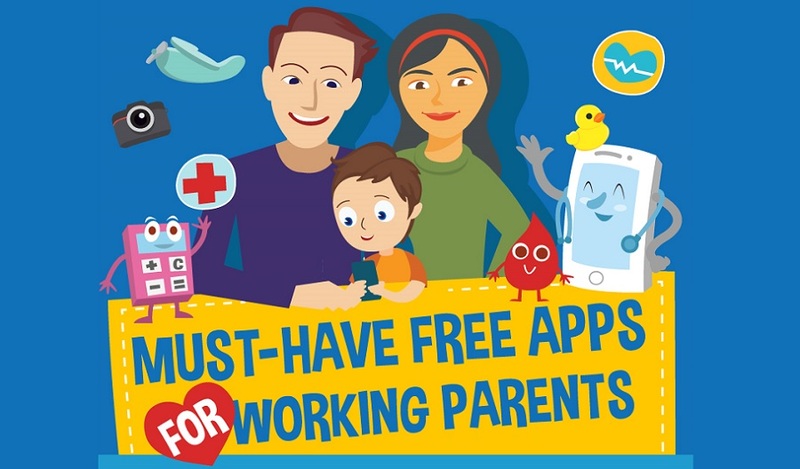 Following Infographic will take you through some free mobile apps that will hopefully make your busy life a small bit easier. The most common problem for a working parents and busy moms is a number of tasks they need to get done every day. They will often need to get up a couple of hours before work to get the kids sorted for school. They then need to go to work for the day but unfortunately, even when they’re finished work - it doesn’t end there as there will be housework waiting for you at home. One app that could save you a bit of time is Chorma as it turns housecleaning into a competition for the entire family. Another great app is Happy Kids Timer and it is especially helpful for teaching young kids to do simple tasks with a range of fun animations and music. If they can even do little things like make their bed in the morning and brush their teeth, this is going to save you five to ten minutes every day and this really adds up! This might give you an extra hour a week to relax with a drink or catch up on your favorite TV show. Even when you get time off work for the family holiday, all the organizing you have to do can nearly be so stressful! The kids are so excited and there’s so much to plan, it’s important to have all the information on hand. That’s where TripCase comes in as you can send all the information about the trip to a dedicated email account. Of course, another issue with working full time and having kids is that it can sometimes be difficult to find the time to catch up on with all the family in the evenings. This is where apps like Path can be very good as it allows you to have a private social media network with just the family. Catch up with everyone on our lunch break by sending a few messages. It may be a good idea as discovered by team HappyCleans to download a few of these to see if any of them are useful. They are all available on both Android/iOS (iPhone, iPad, iPod) so there should be nothing holding you back. If that’s not enough for you, they are also free!